EKO market PR department tasks are consistent with the company strategic goals – there are leading positions and image strengthening, potential clients and consumers informing about comfortable and profitable shopping in our supermarkets. And, naturally, continue to be the one of information space leader in the food retail market. 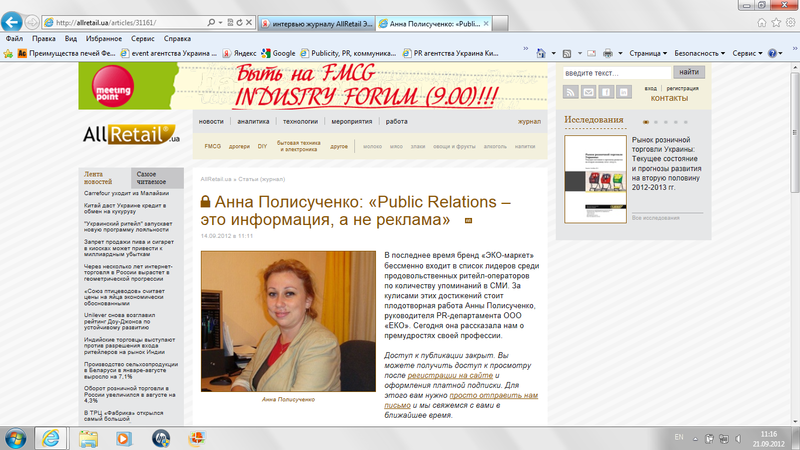 We are cooperating with the professional partner - Publicity Creating Company in PR sphere. This Agency is supporting us in the main PR communication questions. Proactive position, our teamwork and understanding are allows working more systemically and purposefully. Together we are applying the new promotion forms and instruments and trying to go with the times.